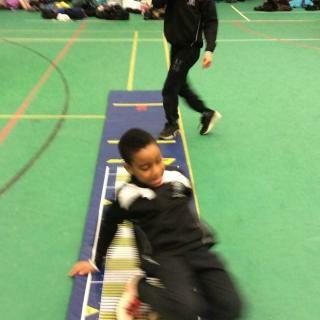 On Thursday 31st January Miss Kotecha and I were given the pleasure of taking 6 Boys and 6 girls to Peter May for the LKS2 Sportshall athletics. The children were chosen a few weeks ago and thanks to a few feel good ambassadors, they had the opportunity to practice some of the events beforehand so they were fully prepared! As you can see from the results above, the children did really well. As sporthall is one of the biggest sporting events for School Games competitions, there were two different sessions held. We therefore have to wait for our results. Fingers crossed! Due to the success of last year, we were once again invited back to lead ‘The Active Festival 2019’. The event was a huge success with the children gaining valuable experience in various leadership qualities. As leaders of their own event, awareness was key. The children quickly learned to adapt to different scenarios: reacting to certain styles of learning and tones of their voice to engage their audience. Another quality was enthusiasm for their lesson. Realising that their enthusiasm was infectious, the children realised they had to inject extra energy into every session they taught which lead to an increase in dedication and commitment from everyone involved in the learning. Communication was another vital skill developed. Inspiring others to reach a given goal was harder than they first thought. To get others to reach their goals required effective communication, which, when working with children they don’t know, proved challenging. For instance, after their first session, where the children couldn’t hear their instructions very well, the Feel Good Ambassadors realised they had to split up and lead a group each, ensuring all children understood the task, maximising learning time. Thank you to all of the Feel Good Ambassadors, Ms Lewis, Omar’s mum and Mr Hayes for taking part and supporting. Eager and raring to go, sixteen of our very best swimmers left to take part in the borough swimming gala. The children quickly settled down and had their lunch so their food could settle before the start of the races. For most children, they took part in an individual race and then a relay with a team. Thank you to all the children for their hard work and determination. Well done to Sarai who overall was the fastest swimmer in the borough at 17:17 seconds for 25m! Unfortunately, we couldn’t take any photos on the poolside but I’m sure if you ask any of the children- or the parents and guardians who came to support us- they’ll tell you how well the children all achieved.